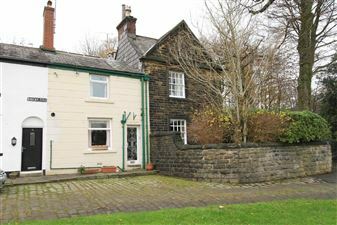 A rare opportunity to buy a stone built garden-fronted cottage in this highly desirable area. Enjoying garden frontage, pleasant open aspect to the front and parking available to the adjacent lay-by, viewing is essential to fully appreciate this delightful cottage. Located in an extremely convenient location being close to the Elephant & Castle pub and eatery, bus stops for Rochdale, Bury and Manchester, excellent caf?s, restaurants and primary schools. The accommodation comprises: LOUNGE with substantial rustic brick fireplace with open fire and beams to ceiling; BREAKFAST-KITCHEN with pine fitted units, Belfast sink, breakfast bar and integral electric oven and hob; DOUBLE BEDROOM with superb view to front and cast iron fireplace; SINGLE BEDROOM with boiler/storage cupboard; BATHROOM with white suite comprising large shower cubicle (plumbed-in shower), bath, WC, washbasin, heated towel rail, tiled floor and part tiled walls; There is a trap door in the landing ceiling to the boarded LOFT which has lighting. EXTERNALLY there is a good sized brick built outhouse of 3.8 m x 1.1 m with power and light. There is a private rear yard with pedestrian access over 596 Bury Road for bins etc. Tenure to be confirmed; Thought to have been built in the late 1800's; Council Tax Band C; Gas central heating; Double glazed to wooden frames. Situated in a pleasant backwater close to local amenities, a deceptively spacious and characterful 3 bedroom cottage with 2 reception rooms. This larger than average mid-terraced house comprises both the stone and rendered sections at the corner of Lee Cottage and the adjoining cottages of Great Lee at the top of Thrum Hall Lane. A delightful property with excellent potential. The accommodation comprises: front door to Great Lee with vestibule leading to the DINING ROOM which has a beamed ceiling and electric fire to surround plus built-in cupboards; INNER HALL with kitchen cupboards and door to the KITCHEN which has fitted units, integral electric double oven, ceramic hob and door to the open rear yard area where the storage building can be found. The MAIN HALL with feature spindled staircase has a store/cloaks cupboard below and a door to the good sized LOUNGE which has a stone fireplace, feature plastered beams and covings and windows to front and side enjoying pleasant aspects. There are 3 bedrooms (2 double and 1 single) and a 4 piece bathroom in champagne comprising bath, shower cubicle, washbasin and WC plus skylight. EXTERNALLY, there is a large store (original garage) to the rear open yard area but no garden (open communal grassed area beyond lane can be enjoyed). The property is understood to be freehold; Gas central heating (combi-condensing boiler); Part double glazed.